You know the dangers of vaccines but aren’t sure how to go about it legally. You need to read this post, know your options, and get an exemption. Debates on vaccines are for another time, this article is for those of you who know you don’t want to vaccinate, but need to know how to go about it. If you need to learn more about vaccines, go here. So you know the dangers of vaccines but need to know how to keep them legally away from your little bundle of joy? Most states only have laws regarding vaccination requirements for school or daycare entry. If you are planning to homeschool, you will still want to follow the law, but know that you have less regulation to deal with. There are three types of vaccination exemption available in the United States: philosophical (18 states), religious (all but three states), and medical (every state). There are only three states that do not have a religious exemption: California (recently), Mississippi, and West Virginia. If you live here and moving is an option, consider it. If not, read on below on how to still avoid vaccinating in these states. There are some states that have vaccine requirements for employment, such as in a healthcare setting. These will typically have an exemption available, and defy equal employment opportunity guidelines if not allowed. Eighteen states have philosophical vaccine exemptions, based on a parent’s philosophical viewpoint. If you live in one of these states, this is definitely your best bet as you don’t need a religious affiliation or a physician to sign off. All but three states have religious exemptions. Use a religious exemption if your state does not have a philosophical exemptions or you have sincere religious beliefs against injecting animal DNA, aborted fetal DNA, or injecting the human body in general. Some states require you to prove your religious affiliation or get a clergy signature. A form may be required, or you may need to write your own religious exemption letter. When writing the letter, be as vague as possible so that any particular tenets you list cannot be argued. Check with your local groups or NVIC if you need more assistance. Christian scientists exempt from vaccination for this reason. If you need assistance, asking a local congregation is a good idea. Every state has medical exemptions, but they are easier to come by in some states than in others. In many states, a medical exemption is only written for children who have already had a severe adverse effect from vaccines (gee, thanks!). For that reason, you will likely want to seek a religious, or philosophical exemption if available to you. In other states, such as Illinois, a law was passed in 2016 allowing a physician to determine a child’s need for a medical exemption based on their own professional opinion. Many opt to test for genetic mutations, such as MTHFR, which impair a person’s ability to detoxify the harmful ingredients in vaccines. This means you are in California, West Virginia, or Mississippi and cannot move. In this case, your best bet in homeschooling, which is way better and easier than you may be thinking. There are entire curriculum and even online schools, as well as homeschool cooperatives where a number of teachers teach your homeschooled child. There are so many homeschooling resources, you do not have to worry you will be doing it alone. 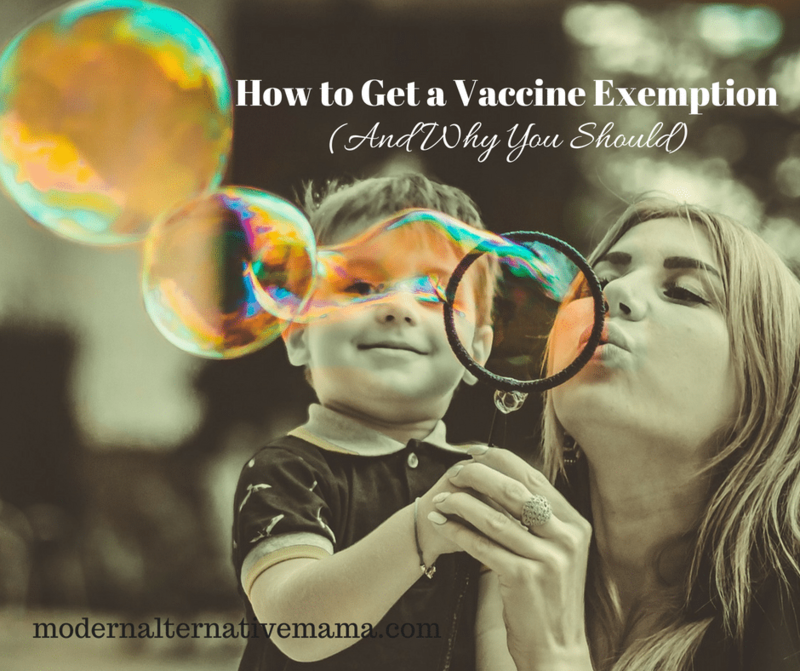 Though there is a medical exemption in these states, that typically means your child must suffer a severe reaction to vaccines before being allowed to obtain one. If you qualify for the medical exemption in any state, be sure to get it as it’s the “strongest” exemption. As soon as you plan to enroll or your child reaches the age of school enrollment, file a vaccine exemption. Even if you homeschool, it’s a good idea to keep applicable state exemptions on file with the school administrator, which may be the mother or father. Check the NVIC.org web site for vaccine laws in your area, and search Facebook and social media for “informed consent” or “vaccine rights” groups in your state. If you cannot locate them, NVIC normally can direct you to their information. When you file your exemption with a daycare or school, I suggest you include a copy of the state law. Surprisingly, even school nurses and administrators are not familiar with the law, and may try to tell you they don’t accept exemptions or yours isn’t valid. And don’t ask “if” they allow the exemption – they have to by law! Be confident and well versed in the law, and let them know you are following the law with your exemption, and expect them to also. Period. You have the right to vaccine exemptions, so exercise your freedom with confidence. 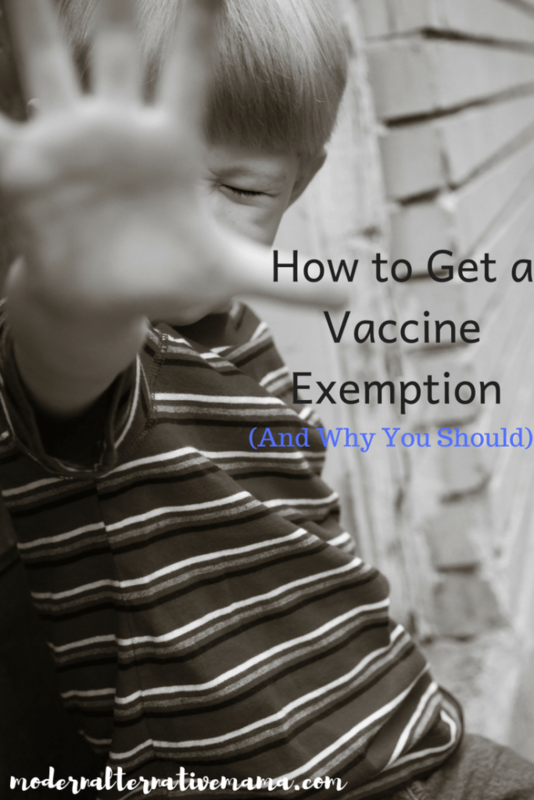 Have you had problems getting a vaccine exemption? It is posts like these that make me so happy that my children are vaccinated. It was a difficult choice to do so because my older son did have a reaction to the Prevnar vaccine that resulted in a slightly delayed vaccine schedule. I am also very upset that you wish to encourage people to undermine the exemption rules for states…the reason California changed its exemption laws was because of nonsense posts like this, encouraging people to ignore decades of vaccine research. Many vaccines have been studied for 50 or more years and the one publicized ‘doctor’ to say that vaccines cause autism was a discredited, irreputable man who used statisitcs to lie. My mother grew up when polio, measles, mumps, etc were common. Kids were not “better off” getting these diseases. My own mom had almost total vision loss due to measles. To not vaccinate should be your choice (that you have researched carefully and of which you understand the serious risks you could be taking). With the exception of one or two vaccines that are shown to not be as effective (like flu), I do believe that children who aren’t vaccinated should be homeschooled (unless a child has a case of actual medical need and not abuse of the system meant to protect kids with real needs). And if you do homeschool, then you don’t need to abuse the system for an exemption. And let’s be real…even the Catholic church supports vaccination as part of its pro life position. Thank you for saying this! I’m an ER RN and I’ve seen kids come in so sick from PREVENTABLE diseases for which wet have vaccines, only to wind up in the ICU intubated and in a vent, or so sick by the time they come to us they are in septic shock and difficult to pull back from the brink of death. As you rightly point out, most vaccines have been studied for decades. They are why some duseases6were eliminired6in our parents’ or grandparents’ lifetimes. They are why peyote considered them miraculous. My maternal grandmother had 9 siblings, but only 5 made it to adulthood because of measles, whooping cough, and scarlet fever. People are free to go back to those ways if they want, but as you say, those kids should absolutely bee homeschooled so they aren’t vectors of disease for many other people. Groups of brainwashed anti-vacc moms are the reason why we’ve had large outbreaks of formerly eliminated or rare childhood diseases in recent years. If people want to go back to the 1800s (or 1930s!) medically speaking, I know grandmother would NEVER have done that; she suffered too much loss too young, as did my great grandmother. Sure, living in the terrible past where kids died of diseases we can now prevent is peoples’ right… Just keep them away from the rest of us living in the 21st century! Oh Tammy. You are part of the sheeple. You need the government to tell you how to live and what is in the best interest of your kids. It is weak minded people like you that allow for this ridiculous unmoral law to exist in this Country! Pathetic! According to the FDA, 99% of serious adverse reactions are NOT reported. According to the CDC, 90% of serious adverse reactions are NOT reported. Medical students are told NOT to report suspected adverse events even though federal law requires doctors to. According to the ASSOC. OF AMERICAN PHYSICIANS AND SURGEONS, 90% of serious vaccine adverse reactions are NOT reported. THE 1986 VACCINE INJURY ACT GRANTS IMMUNITY TO VACCINE MAKERS FROM LAWSUITS. VACCINE-MAKERS THREATENED TO NOT MAKE ANYMORE VACCINES UNLESS PRESIDENT REAGAN SIGNED THE VACCINE INJURY ACT. SINCE PRESIDENT REAGAN KNEW THAT THE VACCINE INDUSTRY WOULD NOT DO ANYTHING TO MAKE THEIR VACCINES SAFER, HE SIGNED THE VACCINE INJURY ACT SO THAT AT LEAST, COMPENSATION CAN BE AWARDED TO THOSE INJURED BY VACCINATION (THIS IS DONE FROM THE TAX ON VACCINES). THIS FOREVER MADE BIG PHARMA INVINCIBLE, UNTOUCHABLE, AND UNSTOPPABLE. SINCE THEY HAVE NO INCENTIVE WHATSOEVER TO MAKE THEIR VACCINES SAFE OR SAFER, THEY CAN PUT ANYTHING THEY WANT IN THEIR VACCINES AND NOT BE HELD ACCOUNTABLE IF YOU OR YOUR CHILD GET ANY OF THE SERIOUS ADVERSE REACTIONS (SIDS, AUTISM, ADD, ADHD, PARALYSIS, DEATH, CANCER, ETC.) TO VACCINE INGREDIENTS: THIMEROSAL (MERCURY), ALUMINUM, FORMALDEHYDE, ANIMAL AND HUMAN FOREIGN MATTER, ETC. SINCE THOSE INGREDIENTS HAVE BEEN FOUND TO IMPAIR BRAIN FUNCTION AND SUPPRESS IMMUNE FUNCTION. THOSE ARE ALL RED FLAGS. 90-95% of 1900’s childhood infectious disease mortality rate decline PRECEDED the vaccines. PLEASE DO YOUR HOMEWORK, OR BETTER YET, TALK WITH A TOXICOLOGY PROFESSOR OR BIOCHEMISTRY PROFESSOR. THEY KNOW MORE ABOUT THOSE TOXIC VACCINE INGREDIENTS THAN DOCTORS AND NURSES. WHAT DOCTORS AND NURSES KNOW IS CONTROLLED INFORMATION PROVIDED BY THE VACCINE-MAKER. YOU’RE WELCOME. GO AND SAVE OTHERS. thank you so much!this is so informative!my question is where do i take my 4 year old to get tested for the MTHR? He’s just received a vaccine and is having adverse effects (mood swings, on /off crying, sometimes unresponsive when he’s asked questions-my pediatrician is recommending in see a nuerologist? I’m very concerned and no longer want him receiving any additional vaccines. please help! i live in NYC and I’m not sure where to get him tested.